The corporate culture can be a lot like a holiday gathering: a drama-infused environment where you're subjected to long-winded recaps of the day while witnessing bizarre behaviors. Sure, some seasonal-ish blessings and thanks get sprinkled in the mix ("Thank goodness I survived another day at this place"), but one thing is for sure: you probably work with a bunch of turkeys. C'mon. You know you do or have in the past. The phrase about not being able to soar with eagles when you work with a bunch of turkeys exists for a reason. We've all been there. Just as a holiday turkey that was cooked too long, there's always one coworker (or five) who creates a hot mess for those around them. So, during this time of year, when a much-needed break from holiday shopping and business stress is welcome, why not take a lighthearted look at the folks you work with? By merging elements from holiday gatherings with the work environment, you'll see that you likely interact with a bunch of, well, odd birds. Do you work with some turkeys? This colleague often lounges around only to emerge flawless in the eyes of others, thanks to those around them who have used the Baster Approach. They bask in the glory of this approach which occurs when other co-workers tend to them regularly. 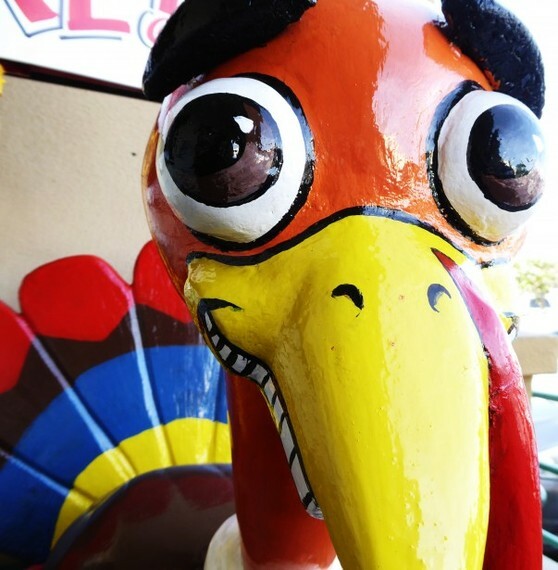 Folks check in on this turkey at least once every hour to make sure all is well, repeatedly coating them with well-timed actions in order to encourage great results. While this goes on, Mr. All Baster, No Business updates Facebook and fills days with gossip. In the end, this lazy turkey goes on to become the well-seasoned obsession of the year, coveted by those who gather around them. This person relies heavily on lucky breaks, wishes and bets to convey thoughts or waddle through jobs. "I wish John wasn't always late to meetings," or "Wanna bet Jen is the first to respond to that email?" are common sayings for The Wishbone. This person conducts business by constantly reminding others that they didn't end up with the larger end of the responsibility stick, so they're therefore free to mosey around the halls and ponder life. At the same time, their words are often disguised as a congratulatory remark. "Hey, you got the bigger end of the deal, so the project is entirely on your shoulders, buddy! Congrats on the client win -- have fun with that!" Also known as a goody-two-shoe, this person is fluent in dishware and food-related business talk, gobbling up every opportunity to showcase their amazing selves. "You know I always step up to the plate," and "Don't you worry, my presentation will have the client forking over some serious dough in no time." "I'm just the person who can trim the fat off this account and keep our budget on track" and "Let's just sit for a moment to digest my idea" are also common phrases used by The Gobbler. And you wonder why your stomach growls in their presence as images of past, present, and future holiday turkeys fill your head. Calm one minute, then bursting with an "I'm ready! See me, hear me, I'm ready!" attitude, the Pop-Up Thermometer often creates anxiety in others. They sit silently for long periods of time, letting heated conversations get the best of them until they can stand it no longer. Without warning...BAM! You glance at them and discover that they're finally ready to let people know what they're all about. Their timing is often off as everyone around them has long-been fidgeting and wondering if anything good will ever come from this turkey. About an hour too late. Some turkeys are a problem from the get-go. They take a lot work, mostly because they've been closed up and frozen for so long. No matter what kind of attention is paid to them -- to include the coddling Baster Approach -- they never seem quite right, and it shows. They have a cold, tough exterior that's hard to soften. Often stewing in their own misery, the Angry Bird pecks at everyone who exists. They're also a fan of rude workplace behaviors which typically includes their personal favorite -- you guessed it -- flipping the proverbial bird to other colleagues for no reason. So there you have it. Turkeys are everywhere. But finding humor in otherwise stressful workplace situations -- which seem to magnify during the holidays -- is important.